Enterprise Application Integration is the science of connecting software applications and hardware systems within a complex enterprise IT environment. It also entails seamless integration with external entities like customers and vendors, adopting a strategic collaborative approach. The integration enables free access and flow of information across devices in a secure and agile manner while overcoming the barriers without any data transfer. Middleware technology and APIs are used for app integration at functional levels, regardless of app types and service provider domains. App integration enables the power of simplifying the complex on-premise and cloud server’s ecosystem, an integral part of technology deployment for an agile IT infrastructure to function consistently and in a unified manner across various business units. Let’s explore the latest Data Integration trends governing the enterprise apps this year. Although all the data is not important, yet huge bulk of data is produced daily across various systems, applications and services. However, enterprises have woken up to the criticality of useful data and its gravity for their business in long term. Businesseshave started deploying latest data integration and data management solutions, such asdPaaS (Data Platform as a Service) to manage and secure their data from the boundaries of applications. Application integration solutions will be accommodating data integration solutions even furtherfor a streamlined and better centralized platform. DevOps stands for “development” and “operations”, the concept that stresses on the significance of communication and collaboration among product management, software development and operating team. DevOps has already been ruling the roost and will continue to do so in 2019 too, since it enables enterprises to follow an agile and lean approach to deliver a successful finer final product to the users while meeting their expectations. Modern business enterprises employa variety of cloud-based applications and services in tandem with on-premise systems; although, the free flow of information across applications and services can be a daunting task. Cloud-based Integrated Solutions are already in vogue among major organizations to integrate back-office systems while shift their SCM systems from on-premise to cloud servers. These agile solutions will be embraced with open arms by many more businesses, given the cost-effective cloud elements, effectiveness of cloud API and flexibility and rapid connectivity while efficiently running numerous business-critical applications. An amalgamation of on-premise systems and cloud integration of applications, hybrid integration employ secure technology like Transport Layer Security (TLS), to patch the gap between enterprise systems and SaaS/PaaS/iPaaS services. Following the cloud integration trends, many more clients are embracing hybrid integration technology as it enables users to access both on-premise data and cloud application-based data in addition to incorporating new systems within the business enterprise. Such advanced and robust solutions are cost-effective and efficiently transfer data while giving a competitive edge and drive innovation. Application integration is not mere connection of two or more applications to enable data flow, it must be result oriented and value-add to end-users. Modern users expect a seamless experience across various devices – be it for shopping, data storage or data access. By mid-2019, integration solutions in e-commerce landscape will steer focus towards ensuring real-time data synchronization between systems across various POS (Point of Sale) – desktop PCs, laptops, handheld devices or store purchase for an enhanced shopping experience to buyers. Internet of Things (IoT) is becoming ubiquitous. The cutthroat competition among enterprises in big data space where the sheer volume, variation and velocity of data are overwhelming. The world of IoTis flooded with new applications and devices against rising demand of real-time data analytics and insights. Integration solutions will make moolah by incorporating IoT technology in a full-sizematured infrastructure to bring together all the connected and next-gen devices and applications within the existing IT system. Enterprise operate in quite a complex environment, mainly with advent of cloud solutions and Pass/Saas. Integrating various platforms and applications is not an easy task for vendors. SaaS integration will not suffice to meet the requirements of increasingly complex IT infrastructure. iPaaS (Integration Platform as a Service) is a cloud integration solution that can be deployed for a cohesive IT environment. iPaaS will witness an incredible demand among businesses due to its ability to deliver simplified point-to-point integrations along with developer tools to design and implement customized integrations. Chatbots, a common name in customer support, primarily in the e-commerce landscape, heavily depend on written or spoken messages to interpret what shoppers want and based on that communicate with them, the function that heavily relies on the robustness of the message platform. Seeking assistance from integration middleware, chatbots can be integrated with company’s mobile applications and databases to draw the desired information spread all over the organization with just a click of a button. Such development will provide umpteen business opportunity in understanding the customer needs much better and grow the e-commerce on different devices. With expanding businesses, rising workforce and struggle for office space and physical devices, many organisations encourage employees to use their own devices, bring your own device (BYOD) to perform multiple business functions in a securely fashionusingbusiness applications. Mostly the applications are connected with company cloud server, accessed via a security code. BYOD policy empowers employees from anywhere anytime in a cost-efficient and flexible manner thus encourage cloud adoption and increase efficiency. Therefore, businesses are pushing for BYOD-focused integration in the existing IT infrastructure. Focus on BYOD driven policies will be a priority. With increasing IT complexities, often, in-house IT teams struggle due to lack of expertise and time to facilitate business workflow and data exchange between multiple applications and software packages. Data security becomes a key concern that CIOs cannot forsake their integration solutions nor experiment with it. Enterprises are turning to third party and IT partners to outsource app integration services. Outsourcing companies efficiently leverage evolving technology, integration maintenance and provide secure and scalable solutions while performing event exchange, routing and workflow implementation. Companies must ensure they are effectively implementing app integration in order to bring about a successful digital transformation before their competitors do. Application integration offers best of service providers to cater to varying integration requirements. There is a rapid adoption of cloud-based integration, in lieu with key elements like mobile, ecommerce, and real-time synchronization. IoT-focused and data-centric integration have gained the center stage in the integration network to counter the big data challenges. 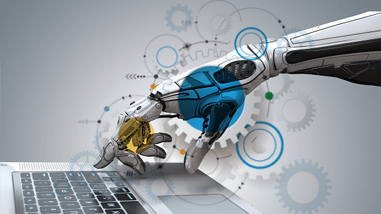 Apart from that DevOps, iPaaS, chatbots and integration outsourcing will be the trends to watch out for into 2019, showcasing an intriguing phenomenon against the rapid evolution of application integration.